Moein, M., Karami, F., Tavallali, H., Ghasemi, Y. (2012). Chemical Composition of the Essential oil of Satureja bachtiarica Bunge. from Iran. Iranian Journal of Pharmaceutical Sciences, 8(4), 277-281. Mahmoodreza Moein; Forough Karami; Hossein Tavallali; Younes Ghasemi. "Chemical Composition of the Essential oil of Satureja bachtiarica Bunge. from Iran". 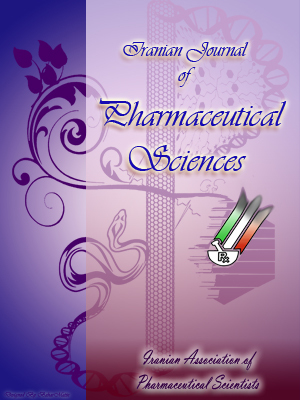 Iranian Journal of Pharmaceutical Sciences, 8, 4, 2012, 277-281. Moein, M., Karami, F., Tavallali, H., Ghasemi, Y. (2012). 'Chemical Composition of the Essential oil of Satureja bachtiarica Bunge. from Iran', Iranian Journal of Pharmaceutical Sciences, 8(4), pp. 277-281. Moein, M., Karami, F., Tavallali, H., Ghasemi, Y. Chemical Composition of the Essential oil of Satureja bachtiarica Bunge. from Iran. Iranian Journal of Pharmaceutical Sciences, 2012; 8(4): 277-281.